Family ownership is the defining characteristic of family businesses, and the transfer of ownership from one generation to the next is the core task in family enterprise continuity. Family business leaders — and particularly those who own large, complex enterprises — have become more proactive about ownership transfer in recent decades. The image of the grieving but expectant family, meeting at the lawyer’s office to hear for the first time a patriarch’s or matriarch’s last will and testament, is increasingly a thing of the past. Many business families invest a significant amount of time and money in drafting shareholder agreements, estate plans, buy/sell procedures, trust creation, tax strategies, holding companies, offshore accounts, and family protocols, with the hope that these mechanisms will protect wealth and at the same time preserve family harmony in the future. 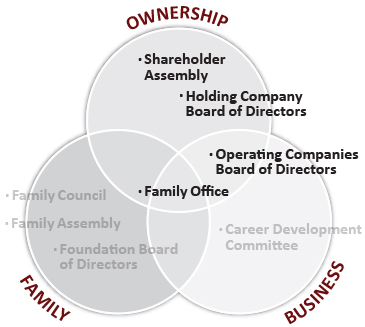 A variety of governance bodies, policies and procedures are available in all three circles to help facilitate the ownership and management of a family enterprise. While we strongly support the notion that formal agreements and financial planning are necessary for the successful continuity of a family enterprise, our experience has taught us that these tools are the framework for solutions, but not the solutions themselves. The utility of all legal and financial transfer structures depends, at the end of the day, on the skill, preparation, good will and commitment of the people whose lives they are intended to benefit. For any plan to succeed, the key is to develop a governing process that enhances trust, and honors the goals and legacy of the seniors while serving the interests of the entire family. Preparing and visioning: setting the stage for ownership discussions; helping current and future owners articulate their aspirations and negotiate a shared vision of future ownership across generations; analyzing the existing estate planning and trust documents. Designing ownership architecture and procedures: creating ownership agreements and formal contracts; choosing the appropriate financial structures (e.g. trusts and trust companies, family offices, philanthropic foundations and funds, internal venture capital funds); integrating estate plans; defining the criteria and the selection process for trustees and professional advisors. Implementing: turning agreements on paper into living operations, with appropriately transparent procedures and realistic, trust-building governance processes; selection and training of family leaders; start-up and evaluation; and finally the full implementation of a self-sustaining ownership continuity system. Contact us to find out more about our work on ownership continuity.